This volume features articles which employ source-work research to trace Kierkegaard's understanding and use of authors from the Patristic and Medieval traditions. It covers an extraordinarily long period of time from Cyprian and Tertullian in the second century to Thomas Ã Kempis in the fifteenth. Despite its heterogeneity and diversity in many aspects, this volume has a clear point of commonality in all its featured sources: Christianity. 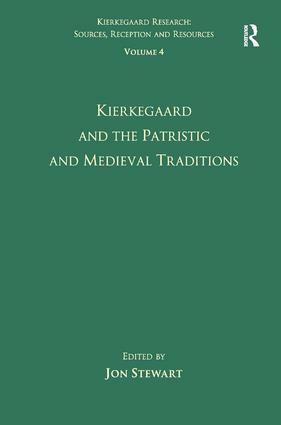 Kierkegaard's relation to the Patristic and Medieval traditions has been a rather neglected area of research in Kierkegaard studies. This is somewhat surprising given the fact that the young Kierkegaard learned about the Patristic authors during his studies at the University of Copenhagen and was clearly fascinated by many aspects of their writings and the conceptions of Christian religiosity found there. With regard to the medieval tradition, in addition to any number of theological issues, medieval mysticism, medieval art, the medieval church, troubadour poetry and the monastic movement were all themes that exercised Kierkegaard during different periods of his life. Although far from uncritical, he seems at times to idolize both the Patristic tradition and the Middle Ages as contrastive terms to the corrupt and decadent modern world with its complacent Christianity. While he clearly regards the specific forms of this Medieval appropriation of Christianity to be misguided, he is nonetheless positively disposed toward the general understanding of it as something to be lived and realized by each individual. Contents: Preface; Part I The Patristic Tradition: Athanasius: Kierkegaard's curious comment, Robert Puchniak; Augustine: Kierkegaard's tempered admiration of Augustine, Robert Puchniak; Bernard of Clairvaux: Kierkegaard's reception of the last of the Fathers, Jack Mulder Jr; Chrysostom: between the hermitage and the city, Leo Stan; Cyprian of Carthage: Kierkegaard, Cyprian, and the 'urgent needs of the times', Jack Mulder Jr; Gregory of Nyssa: locating the Cappadocian fathers in Kierkegaard's church-historical narrative, Joseph Ballan; Irenaeus: on law, gospel and the grace of death, Paul Martens; Origen: Kierkegaard's equivocal appropriation of Origen of Alexandria, Paul Martens; Pelagius: Kierkegaard's use of Pelagius and Pelagianism, Rob Puchniak; Tertullian: the teacher of the credo quia absurdum, Pierre BÃ¼hler. Part II The Medieval Tradition: Abelard: Kierkegaard's reflections on the unhappy love of a scholastic dialectician, IstvÃ¡n CzakÃ³; Anselm of Canterbury: the ambivalent legacy of faith seeking understanding, Lee C. Barrett; Thomas Aquinas: Kierkegaard's view based on scattered and uncertain sources, Benjamin Olivares BÃ¸geskov; Boethius: Kierkegaard and The Consolation, Joseph Westfall; Dante: tours of Hell: mapping the landscape of sin and despair, Thomas Miles; Meister Eckhart: the patriarch of German speculation who was Lebemeister; Meister Eckhart's silent way into Kierkegaard's corpus, Peter Å ajda; Petrarch: Kierkegaard's few and one-sided references to a like-minded thinker, Karl Verstrynge; Tauler: a teacher in spiritual dietethics: Kiekegaard's reception of Johannes Tauler, Peter Å ajda; Thomas Ã Kempis: Devotio Moderna and Kierkegaard's critique of 'bourgeois-philistinism, Joel D.S. Rasmussen; Troubadour poetry: the young Kierkegaard's study on troubadours - 'with respect to the concept of the romantic', Tonny Aagaard Olesen; Indexes. Jon Stewart is an Associate Research Professor in the SÃ¸ren Kierkegaard Research Centre at the University of Copenhagen, Denmark.